I am a senior lecturer in marine biology, specialized in larval ecology of benthic invertebrates and benthic ecology. In 1991, I graduated in Biological Sciences at Facultad de Ciencias, Universidad de la República, Uruguay. 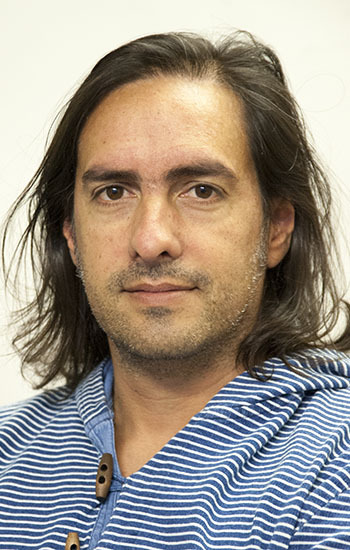 I did my MSc (1996) and PhD (2000) also in Uruguay, in the context of the Uruguayan Postgraduate programme (PEDECIBA) and the German academic exchange programme (DAAD). My theses were developed in the Alfred Wegener Institute for Polar and Marine Research, Marine Station of Helgoland, Germany, focusing on ecological consequences of maternal effects and developmental plasticity. From 1992 to September of 2007, I had a position as Assistente Gr. 2 at Seccion Oceanología, also at Facultad de Ciencias, Uruguay. Between 2003 and 2005 I undertook postdoctoral research also at the Marine Station of Helgoland financed by the Alexander von Humboldt Foundation. My research interests are focused in determining causes of patterns of distribution of marine organisms with emphases on the larval ecology of marine benthic invertebrates. I work in eco-physiology (effects of environmental conditions on larval growth, development and survival), in undersanding the role of larval supply, and phenotypic plasticity (maternal, carry-over, latent and other developmental effects) in driving recruitment of benthic invertebrates. I also work in community ecology, studying causes of patterns of community structure at multiple spatial scales and in the role of larvae for metapopulation connectivity and benthic-pelagic coupling. I teach a range of undergraduate and postgraduate modules in marine ecology. Franziska Spitzner (external Co-supervisor, with Harzsch: Greifswald University, Germany).Effects of abiotic stress on neurogenesis in the developing brain of crustacean larvae. Funded by RESPONSE programme, Graduierte Coleg, DFG, Germany. Darbyshire, Teresa (Supervisor).The Systematics of the Polychaetes of the Falkland Islands. Rebekah Newstead (Co-supervisor, with Wilson) Feeding ecology and grazing of mesozooplankton from the Amundsen Sea Polynya, Antarctica. Funded by NERC. Amy Curry (Supervisor, with Whiteley) Early life stages of brachyuran crabs and the influence of ocean acidification and reduced salinity on their development and performance. Funded by NERC. Please, contact me if you are interested in developing a PhD in the following topics related to larval ecology of benthic invertebrates; benthic community ecology; effects of multiple stressors on marine organisms. Most of my work is carried out using marine crustaceans as model species. Exploring mechanisms linking temperature increase and larval phenology: the importance of variance effects. Relationships between habitat conditions, larval traits, and juvenile performance in a marine invertebrate. Connectivity and patch area in a coastal marine landscape: Disentangling their influence on local species richness and composition. Rapid changes in the epifaunal community after detachment of buoyant benthic macroalgae. Community composition of the rocky intertidal at Helgoland (German Bight, North Sea). Scale-dependent patterns of variability in species assemblages of the rocky intertidal at Helgoland (German Bight, North Sea). Cumulative effects of low salinity on larval growth and biochemical composition in an estuarine crab, Neohelice granulata. Effects of osmotic stress on crustacean larval growth and protein and lipid levels are related to life-histories: the genus Armases as a model. Seasonal changes in digestive enzyme (trypsin) activity of the copepods Pseudocalanus minutus (Calanoida) and Oithona similis (Cyclopoida) in the Arctic Kongsfjorden (Svalbard). Settlement of shore crab Carcinus maenas on a mesotidal open habitat as a function of transport mechanisms. Composition and intra-annual variation of the macroinfauna in the estuarine zone of the Pando Stream (Uruguay). Metamorphosis of a sesarmid river crab, Armases roberti: stimulation by adult odours vs. inhibition by salinity stress. Effects of reduced salinities on metamorphosis of a freshwater-tolerant sesarmid crab, Armases roberti: Is upstream migration in the megalopa stage constrained by increasing osmotic stress? Phenotypic links in complex life cycles: conclusions from studies with decapod crustaceans. Unravelling the complex structure of a benthic community: A multiscale-multianalytical approach to an estuarine sandflat. Gimenez, L, Conde, D (ed.) & Scarabino, F (ed.) 2006, Comunidades bentónicas estuarinas de la costa uruguaya. in Bases para la conservacicón y manejo de la costa uruguaya. 2006 edn, Vida Silvestre, Montevideo, pp. 179-188. Gimenez, L, Yannicelli, B, Conde, D (ed.) & Scarabino, F (ed.) 2006, Ecología de comunidades de playas de Cabo Polonio (Rocha, Uruguay). in Bases para la conservacicón y manejo de la costa uruguaya. 2006 edn, Vida Silvestre, Montevideo, pp. 535-544. Patrones geográficos de diversidad bentónica en el litoral rocoso de Uruguay. Brazeiro, A, Borthagaray, A, Gimenez, L, Conde, D (ed.) & Scarabino, F (ed.) 2006, Patrones geográficos de diversidad bentónica en el litoral rocoso de Uruguay. in Bases para la conservacicón y manejo de la costa uruguaya. 2006 edn, Vida Silvestre, Montevideo, pp. 171-178. Scale-dependent patterns of macrofaunal distribution in soft-sediment intertidal habitats along a large-scale estuarine gradient. Effects of temporary food limitation on survival and development of brachyuran crab larvae. Marine community ecology: the importance of trait-mediated effects propagating through complex life cycles. Linking life history traits in successive phases of a complex life cycle: effects of larval biomass on early juvenile development in an estuarine crab Chasmagnathus granulata. Larval performance in an estuarine crab, Chasmagnathus granulata, is a consequence of both larval and embryonic experience. Marine Life of Uruguay: critical update and priorities for future research. Calliari, D, Defeo, O, Cervetto, G, Gomez, M, Gimenez, L, Scarabino, F, Brazeiro, A & Norbis, W 2003, 'Marine Life of Uruguay: critical update and priorities for future research. ', Gayana, vol. 67, no. 2, pp. 341-370. Potential effects of physiological plastic responses to salinity on population networks of the estuarine crab Chasmagnathus granulata. Larval growth in the estuarine crab Chasmagnathus granulata: the importance of salinity experienced during embryonic development, and the initial larval biomass. Swimming ability and burrowing time of two cirolanid isopods from different levels of exposed sandy beaches. Effects of prehatching salinity and initial larval biomass on survival and duration of development in the zoea 1 of the estuarine crab, Chasmagnathus granulata, under nutritional stress. Ontogeny of osmoregulation, physiological plasticity and larval export strategy in the grapsid crab Chasmagnathus granulata (Crustacea, Decapoda). Relationships among salinity, egg size, embryonic development, and larval biomass in the estuarine crab Chasmagnathus granulata Dana, 1851. Activity rhythms of two cirolanid isopods from an exposed microtidal sandy beach in Uruguay. Longshore patterns of distribution of macroinfauna in a Uruguayan sandy beach: an analysis at different spatial scales and their potential causes. CSIC (I+D) Grant (Research council of Universidad de la República, Uruguay), ca. £16,000 Muniz, Giménez (2013-2015). Role of hypoxic/anoxic events on estuarine systems of the Uruguayan coast. NERC Standard Grant (NE/J007544/1), ca.£ 457,000. Whiteley N, Giménez L, McCarthy I, Hutton C. Climate change and the costs of survival in two species of marine crabs with contrasting abilities to compensate for environmental change. 2012-2014. INIA, (Institute of Agricultural Research, Spain). Guerao, Rotllant (IRTA, Spain), Giménez et al. (2012-2014). Optimization of larval rearing of Maja brachydactyla. FST Standard grant (Research Council Portugal) Calado, Queiroga (University of Aveiro), Giménez, et al. (2012-2014). Metamorphosis does not erase the larval and embryonic history.